As we enter the busiest time of year for bloggers the stress can mount! I find the best way to stop this stress in its tracks is productivity and getting ahead. 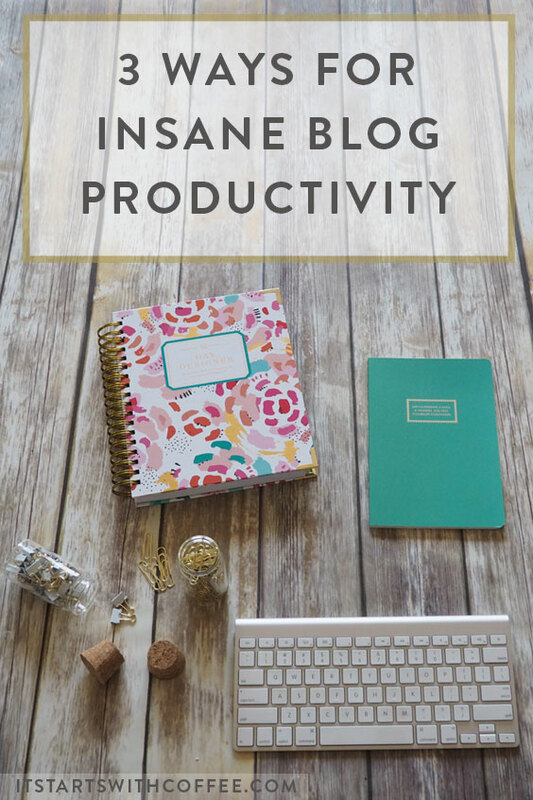 Today I am sharing 3 ways for insane blog productivity so you don’t fall into a stress hole! Keep an editorial calendar: With the busiest time of year an editorial or content calendar depending on how you phrase it is necessary! There is no way to accept campaigns or plan out gift guides without knowing where in your week they fit. It’s also helpful because it shows you where things can fit well. This way you don’t have two sponsored posts back to back (even though sometimes it may be out of your control). Or maybe you don’t have gift guides every day one week you can spread them out more. Keep up with emails: Ugh emails. They can really pile up. I try to respond to everything, even things that aren’t a good fit, so I really suggest starting your day with answering any unanswered emails from the day before and ending your day trying to answer any emails that came in that day. I know things can happen during the day but trying to respond as soon as possible alleviates stress from you and also shows people/brands you are prompt. Make notes of deadlines: I put all major deadlines for drafts, projects, etc in my Google Calendar and have alerts days in advance so that I am making sure I am on top of things. You don’t want to be that person writing a subpar post last minute or taking bad photos because you ran out of time. Give yourself plenty of time. Check this post out where I talk about batch writing and batch photography! These three things may seem obvious or maybe you are already doing them but by doing these three things you will find that so much of your stress is relieved. The more you plan and stay on top of things the better off you are! How do you motivate yourself for productivity? An editorial calendar is a life-saver! I can’t remember how I survived back when I didn’t have one. It keeps me organised. I need to organize and editorial calendar. I already use my google calendar for everything else (Pinterest, bills, everything), I should probably add another topic and start tracking my blogging there too. These are three things I neglect to do! Thank you for the reminder because I really need to be more productive when it comes to my blog! Yes! The editorial calendar is actually way more useful than I thought it would be. I love your blog! It’s beautiful and so well organized! Adhering to my editorial calendar is a real struggle. I often just write about what inspires me and forget my plans all together. I’m going to have to stick to my plan more come the holiday season. I’m trying to get better about responding promptly to blog emails because I can get overwhelmed and behind so quickly! Having an editorial calendar is extremely helpful too!! I use my gmail calendar to help me keep on task also. I love all of the notifications you can use and the ability to add notes where needed. Keeping up with emails can be a tough task, especially this time of year. Love these tips! Keeping an editorial calendar definitely helps me with blog productivity – but it’s still a habit I need to work on utilizing even more! Just stumbled across your blog…love all of your helpful posts and look forward to reading more! I have a whole list of future blog posts/topics and even some written up that I just need photos and/or graphics for, and that does make it handy. I just need to get better with scheduling things ahead, but I’m really hoping to do that in the next month or so before the holiday rush really hits! Great tips! This is fantastic. Appreciate you sharing. Some of these I’ve been doing already but I need to get better at managing my deadlines. Such great tips! Using Google Calendar for deadlines has been a game changer for me. It’s easier to focus on one task at a time by deadline than look at 10 pending projects. These are great tips! I need to get better at using a calendar and planning ahead. These are really great tips! I would love to learn to be more consistent with coming up with quality articles that cater to the interests of my readers. Keeping up with email too is a good thing. Customer/reader interaction gives them a more personalized experience. Perfect timing to come across this article. I really need to step up my game with blogging. It has been a while since I had the chance to write an article. Hopefully, all these illnesses plaguing my family would be resolved soon. I will keep your tips in mind once I get started again. Thanks for sharing such a great post. This tips will definitely help me to be organized.